Let’s face it, finding the best mountain hunting boots that suits your style can be difficult, especially if you are a beginner. Do you give preference to fitting and comfort? How to find the right footwear that lasts long and the test of the wilderness? We understand you want to choose the right pair from the pool of brands and models available. Fortunately, we have a solution to your never-ending search for the best mountain hunting boots. Before you jump to make a purchase, use our buyer’s guide to learn the key features of high-quality boots. This will not only help in choosing the most suitable pair but save you time and money as well. 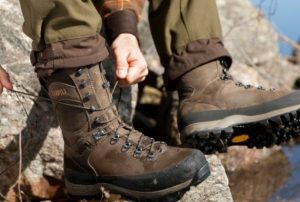 How to choose the best mountain hunting boots? To help choose your new footwear for the wild, we performed thorough research considering key features of proper hunting footwear. 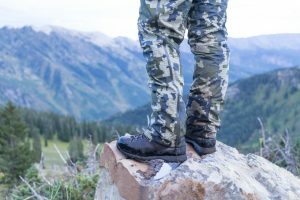 Whether you are looking for the best elk hunting boots or bow hunting boots, this buyer’s guide will make it easier for you to choose the best pair to buy. The wild terrain can change with the weather. You may need new hunting boots for uphill, downhill, muddy, snowy, slippery, or rainy trails. Our buyer’s guide will focus on comparing products on the basis of size and fit, material, insulation, soles, comfort, height, and weight. Your field boots are the most important part of your gear. The question is whether you need a versatile all-around or a special fit? The right size and fit are crucial for making a purchase decision. Pay close attention to the fitting as it should sit well and never push or scrape. They should be 1-2 sizes larger than your daily footwear size. Ensure a secure and stable grip inside the fully laced up boot and it should easily fit multiple layers of thick socks to hunt in the morning. It is advisable to take a walk in your boots or perform a jump test to ensure their fitting. It does not matter how fitting your hunting bootsare if they can’t last more than a few outings. Look for boots made with highly stable and long-lasting material, however, note higher quality comes at a higher price. Avoid boots that are glued to the soles. Leather construction is considered the most suitable as it is highly resistant. For hunters who fight their way through the rivers, streams, swamps, and puddles, boots with Gore-Tex linings are the best choice. Good waterproof hunting boots provide an edge in the waterlogged areas. Rubber provides excellent waterproofing no matter the weather. Choose only the best waterproof hunting boots to protect against moisture and dirt, which will otherwise ruin your performance. For extremely cold days in the winter, boots with warm linings, such as lambskin, insulating felt, or in-rubber with a neoprene lining are best. The sole should also be non-slip and well insulated so the cold does not penetrate to the feet. Look for the best warm hunting boots with reinforced stitching and integrated Thinsulate or natural neoprene material. This provides insulation and ensures warm feet, especially for longer periods in the winter. Perfect insulation must be ensured in the sole during the cold so internal heat cannot escape. Use highly insulated hunting boots that provide insulation around your ankles as well. Consider this – the sole of a shoe constantly bears the weight of your entire body and gear for several hours. The quality of the soles can make or break your game. A non-slip tread sole is particularly important in hunting boots to get a firm footing, as wet ground is often slippery. A hard or rigid sole can break on impact so choose only the best rubber hunting boots. A thick sole offers protection to the foot from being punctured from below. On the other hand, a thin sole is perfect for gaining speed. Camo rubber hunting boots soles can absorb shocks easily and also provide waterproofing. For a demanding hunt or a drifting and driving hunt, a taller fit is recommended, as it encloses and supports the ankle. Imagine a sprained ankle in the middle of the night, which is sure to spoil your outdoor adventure! A leather shoe will adapt to any foot shape. It is also advisable to pay attention to supporting ankle padding, so you can walk easily across long distances. 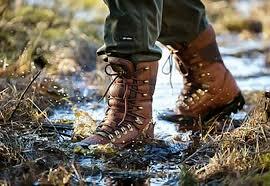 Furthermore, it is important that only breathable and the most comfortable hunting boots be used for hiking. The next criteria for choosing the right boot is the height. Depending on the terrain in which the hunt takes place, you should choose a short bootleg, similar to a classic hiking boot, or high top shoes with a shaft height that goes to the calf. High-end hunting boots are more suitable for flat areas. For stalking in mountainous regions with impassable ascents and descents, boots with a comparatively short height are recommended. You will need the best lightweight hunting boots for certain terrain during your hunt. Although waterproof, rubber boots are not recommended as they are heavier and non-breathable. Look for lightweight hunting boots for sale made with a combination of different materials. Nylon boots are lighter compared to rubber and leather. Using Nylon boots for long stretches is highly comfortable and suitable as they withstand rough terrain. If you’re scaling the mountains for a hunt, your feet will experience some harsh terrain and weather, so ensure you have the best mountain hunting boots so you won’t get fatigued or feel uncomfortable. There are several on the market, so it can be time-consuming finding the right pair. To cut down on your search, we’ve compiled reviews of seven of the best boots for mountain hunting wear. Danner Men’s Pronghorn 8″ Un-insulated Hunting Boots handle rough terrain, making them ideal backcountry hunting boots. They feature a three-density footbed for cushioning The GORE-TEX lining is breathable as well as 100% waterproof, and for a secure fit, it has a wider platform and toe box. 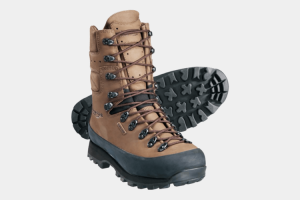 Made from full-grain leather and lightweight nylon, these are designed waterproof and with Danner Pronghorn outsoles for greater traction along with a Terra Force supportive platform. Danner Men’s Pronghorn 8″ Un-insulated Hunting Boot offers all-day support and comfort once broken in, and they resist well against abrasions and moisture. 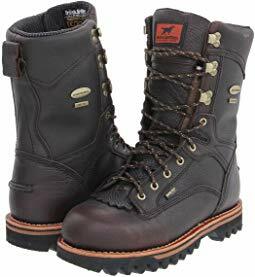 Irish Setter Men’s 860 Elk Tracker Waterproof Hunting Boot features a GORE-TEX membrane that blocks moisture from outside and inside, helpful for those wading through water or who have feet prone to sweating. There’s a scent ban as well to control odors also. In addition, there’s Thinsulate insulation so you stay warm, and they’re only 3M, making these lightweight waterproof hunting boots. The uppers are full-grain leather that’s also waterproof, the soles offer great traction, and the Thinsulate insulation is thin and lightweight. Irish Setter Men’s 860 Elk Tracker Waterproof Hunting Boot offers lightweight insulation while also keeping your feet dry and odor-free. Irish Setter Men’s Vaprtrek Hunting Boot offers flexibility and relief thanks to the four-way stretch nylon, and they minimize pressure on your shins. They’re great bow hunting boots considering their Realtree Xtra Camouflage design that blends you into your environment. In addition, they’re moisture wicking and feature traction support for tree stands, downhill use, and more. Lightweight and featuring four-way stretch for flexibility, these use minor insulation with high-density construction while also using unique soles for greater traction and durability. 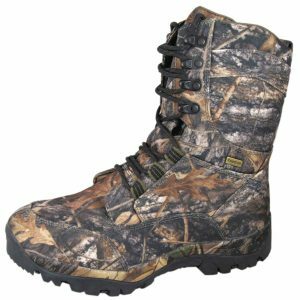 Irish Setter Men’s Vaprtrek Hunting Boot feature unique camo design, waterproof components, and flexibility for ideal support and traction. Lowa Men’s Tibet GTX Trekking Boot features 100% nubuck leather that’s durable and waterproof. Further waterproof capabilities come from the GORE-TEX lining. The lining also features Climate Control to manage heat and moisture. They’re great hunting boots that offer ankle flex and an ideal heel fit for easy walking. Made from durable Nubuck leather, these feature no insulation, a no-slippage lacing system alongside the rubber rand for terrain support, and a stabilizer for further underfoot support. 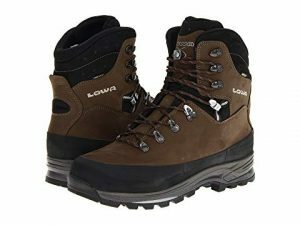 Lowa Men’s Tibet GTX Trekking Boot is flexible and supportive on various terrain while also keeping your feet relatively dry. 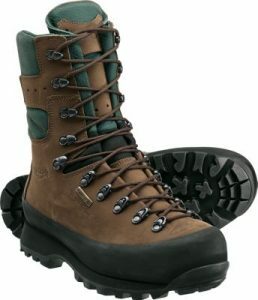 Kenetrek Men’s Mountain Extreme 400 Hunting Boot offers waterproof protection all around to keep you dry no matter what. They’re good insulated hunting boots as they feature 400g Thinsulate insulation. 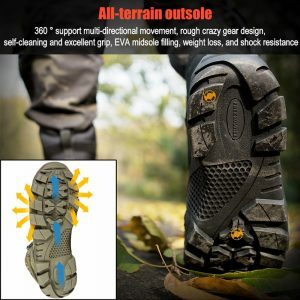 In addition, they’re durable against abrasions, and their tread penetrates deep enough to keep you stable whether you’re walking in mud, snow, or dry rough ground. The full-grain premium leather is constructed with no seams down the tongue to prevent abrasions, while the flexible membrane is breathable and waterproof, and the K-Talon offers deep relief in various terrain. Kenetrek Men’s Mountain Extreme 400 Hunting Boot provides tremendous ankle and side support, a durable leather construction, and a good waterproof barrier. Kenetrek Mountain Extreme Non-Insulated Hiking Boot has a breathable, flexible membrane that can hold its own against wet conditions. They’re un-insulated hunting boots that are better suited for warm weather use. Even so, they still provide good traction support over rough, rocky terrain without weighing you down. The thick leather offers no seams to help with waterproof protection, while the K-Talon outsoles provide a deep, wide tread pattern for security along with supportive midsoles. Kenetrek Mountain Extreme Non-Insulated Hiking Boot provides lightweight traction support and good flexibility for comfort. Smoky Mountain Waterproof Men’s Hunter Boot is the go-to choice if you’re shopping for budget hunting boots. They offer a good amount of insulation for average cold conditions. In addition, they feature a lightweight sole with a good tread pattern for protection against slips, while also offering waterproof protection. Made from leather with a cordura nylon upper, these boots feature a waterproof membrane, a Thinsulate lining made from 400g, and a lightweight sole. Smoky Mountain Waterproof Men’s Hunter Boot utilizes lightweight insulation and waterproof protection with good soles to last you through treks in the mountain. If you’re still weighing your options before deciding on any boots, check out our FAQ section down below. It’ll teach you about some things to consider before making any purchases such as insulation and sizing. What are the best hunting boots for cold weather? In many cases, hunting up in the mountains can get chilly, so it pays to have the best winter hunting boots in these circumstances. Out of the ones we’ve reviewed, you can go with the Irish Setter Men’s 860 Elk Tracker Waterproof Hunting Boots. 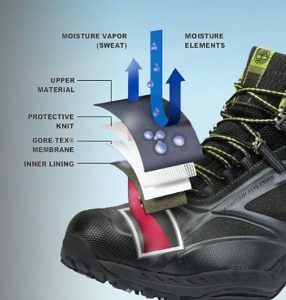 They’re rated high for insulation to keep out the cold in addition to being waterproof to protect against snow. The amount of grams can vary depending on your environment and weather conditions. For instance, if you’re hunting in warm weather, then you won’t have to worry much about insulation. Something that’s un-insulated can serve you well enough. That way, you won’t overheat and sweat. However, if conditions get chilly, consider good insulated hunting boots with 200g or more. These are good for lower temperatures yet ideal for performing high activities such as hiking while hunting. Anything extremely cold, and it’s best to go up to 1000g or more. What size hunter boots should I get? 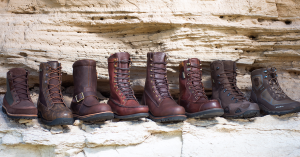 Choosing a size is based on whether or not the boots in question run true to size. Having a boot that matches your feet can ensure that you have a fit that is comfortable, easy to walk in, and won’t cause fatigue after spending hours on your feet. High-end hunting boots usually mold or contour to your feet so you have a more personalized fit while also offering the right amount of toe box width to compensate swelling. 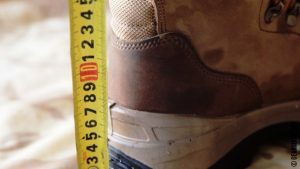 Consider your shoe size when buying boots, but always account for swelling as well as the fact that some run larger or smaller depending on the boot and company. Considering all seven of the boots we reviewed, we recommend the Danner Men’s Pronghorn 8″ Un-insulated Hunting Boot as among the best mountain hunting boots you can buy. They feature a supportive platform to stabilize, and they have waterproof capabilities so your feet stay dry up on the mountains. 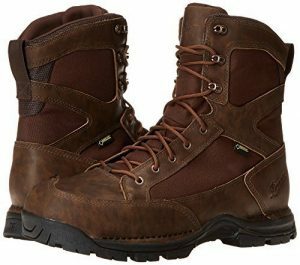 Irish Setter Men’s 860 Elk Tracker Waterproof Hunting Boot: Lightweight insulation and waterproof. 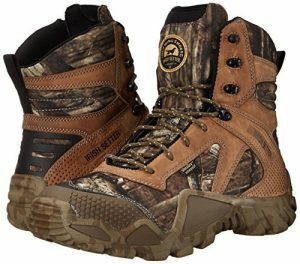 Irish Setter Men’s Vaprtrek Hunting Boot: Unique tread pattern and good flexibility. Lowa Men’s Tibet GTX Trekking Boot: Great traction support and ankle flex. Kenetrek Men’s Mountain Extreme 400 Hunting Boot: Good ankle and side support and waterproof barrier. Kenetrek Mountain Extreme Non-Insulated Hiking Boot: Waterproof protection and lightweight traction. Smoky Mountain Waterproof Men’s Hunter Boot: Average amount of insulation with a waterproof membrane.